For the second time in a month, San Diego Gas & Electric unveiled an innovative battery backup system designed to speed the utility’s transition to renewable energy. The vanadium redox flow battery storage facility opened Thursday in Bonita is the largest installation of this new technology in the United States. It’s capable of powering 1,000 homes for four hours. Top executives from SDG&E were joined by their counterparts from Sumitomo Electric, which developed the technology, and the Consul General of Japan in Los Angeles to formally begin a four-year test of the batteries. “Storing energy in batteries such as these allows us to provide clean energy to our customers more hours of the day,” said Caroline Winn, SDG&E’s chief operating officer. 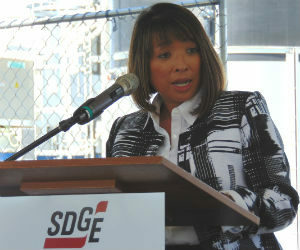 SDG&E’s Caroline Winn in front of the batteries. SDG&E already generates more than a third of its power from renewable sources — the most of any U.S. utility — and increasingly needs technology to store it. The batteries also take the place of conventional natural gas-powered generators that kick in during periods of peak demand. The new project is smaller than the one in Escondido — 2 megawatts versus 30 megawatts — and the technology is more expensive, but the batteries are expected to last up to 30 years, versus 10-12 years for lithium-ion technology. 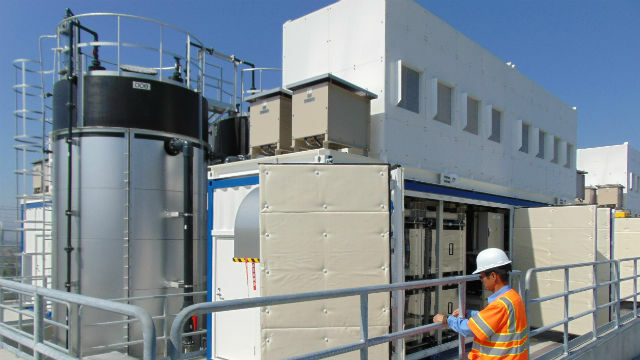 The Japanese consul general, Akira Chiba, described the new storage system as a “game changer” in clean energy and praised the partnership between California and Japan in developing the needed technology.